The finest professional cutlery designed and produced with traditional Dexter-Russell experience and craftsmanship. Stain-free, high-carbon steel blades with hand-ground edges honed to ultimate sharpness. Formed, sanitary handles of laminated rosewood are impervious to stain, hot-water and food acid. Seven inch Forged Santoku. A Japanese chef knife with a full tang and bolster, rosewood handles with Brass rivets. 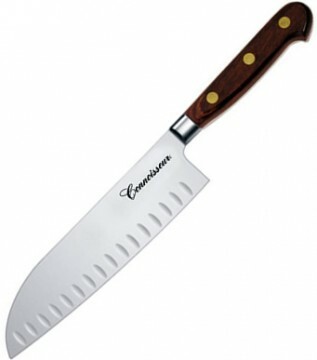 It also Has a granton edge so no food sticks to the sides of the knife.